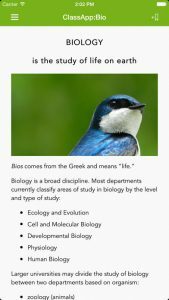 ClassApp: Biology for UofT is a custom-made app for undergraduate students taking biology courses at the University of Toronto. It was developed to be a practical tool for you. Its only mission is to make your life easier, so please give us feedback about what works and what doesn't. We wanted to fill the gap between the textbook and professor by offering a virtual binder of tips and information that your professor probably won’t have time to teach you, but you’ll still be expected to know. It is a 'toolkit' for navigating the many requirements for doing assignments: finding relevant journal articles, improving grammar and spelling, citing references, avoiding plagiarism, etc. It will help you fill in gaps you may not even know you have. It will help you find quick answers to common questions (like how to format references). Plus there's plenty of bonus biology highlights, including key definitions, links to cutting edge science news, and the best bio-movie for a Friday night (whether ‘B’ movie or documentary). And just for UofT students, there are links to Blackboard, departments, ELL resources, and biology career paths. At ClassApp, we believe that each student needs only two things to succeed in a biology class: the textbook and this app . . . oh, and an instructor. Make that three things. 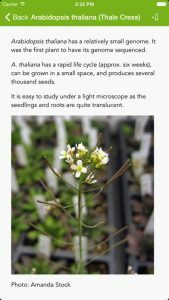 Embrace it as a tool for learning about and loving biology through RSS feeds and links to journal articles, movies, and books.